Artists are sometimes quite eccentric but Hustvedt has invented a real corker in the large, red-haired, brilliant and probably mad Harriet Burden, rich widow of Felix Burden the successful NY art dealer. This book is a collection of fictitious letters, diary entries, interviews, reports and so on collected by one I.V. Hess, the fictional editor. The result is a kick – for me, it’s one of those “I wish I’d thought of that” deals. Hustvedt skewers the art world via a plot dealing with a scheme Burden cooked up to pull off a very pointed hoax. Burden creates installation art including metamorphs, dolls of various size and shape which are sometimes warmed. She installs them in “rooms” which are viewed by observers. She does other art projects, too. So because she and her art have been ignored by the public, she finds three very different men who will pose as the artists of three exhibits. These guys and Burden’s art create their own sensations, but what will happen when the truth comes out? Actually, in a way, these men become a part of her installation – until Rune, perhaps. There are several themes coursing their way through Hustvedt’s tale. The first is about reality vs perception – do we see what is there? Or do we see what we want to see? Maybe we see what our culture tells us to see. And then there’s aesthetic valuing … This, I think, is the main point of Burden’s 3-part exhibition known as Masks. And to me, a theme of 21st century feminist (3rd wave?) is included in that the book is not about male-bashing alone, although there is some of that, there’s some feminist bashing in it, too. still, the basic idea may be feminist although at times that’s turned on its head. 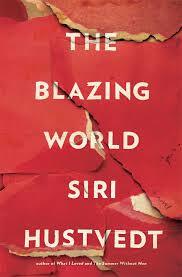 Hustvedt satirizes everything except the reality of 9/11. Is Burden sane? I have no idea – what are the parameters of sanity? I do know that she’s big, warm and loving, but also aging and angry as hell. I would likely not want to know her in person, but in Hustvedt’s hands she’s wonderful. On the downside, there isn’t much difference between most of the voices of the narrators, the 1st person contributors, except for Harry, her journal entries are unique as are those from a couple of others. i suppose this is a difficult novel in some ways, the ideas are concerned with psychology, philosophy and feminism but for me it was more like a romp, very funny.